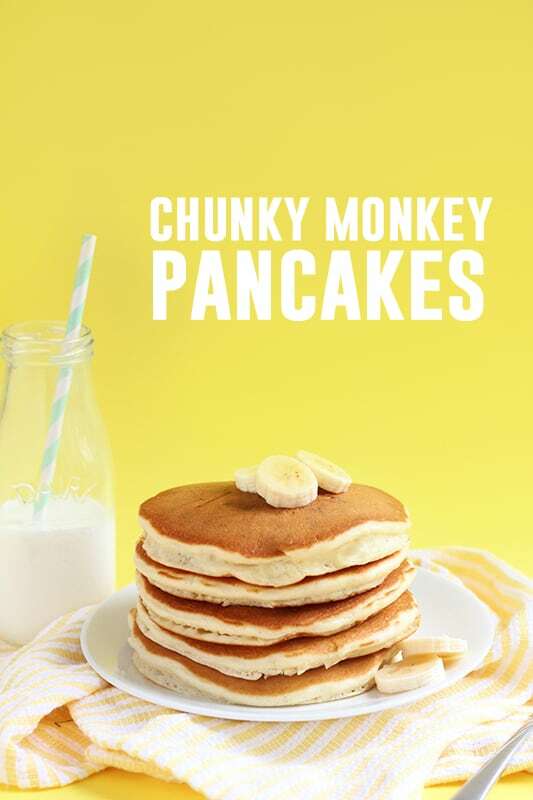 Chunky Monkey Pancakes. 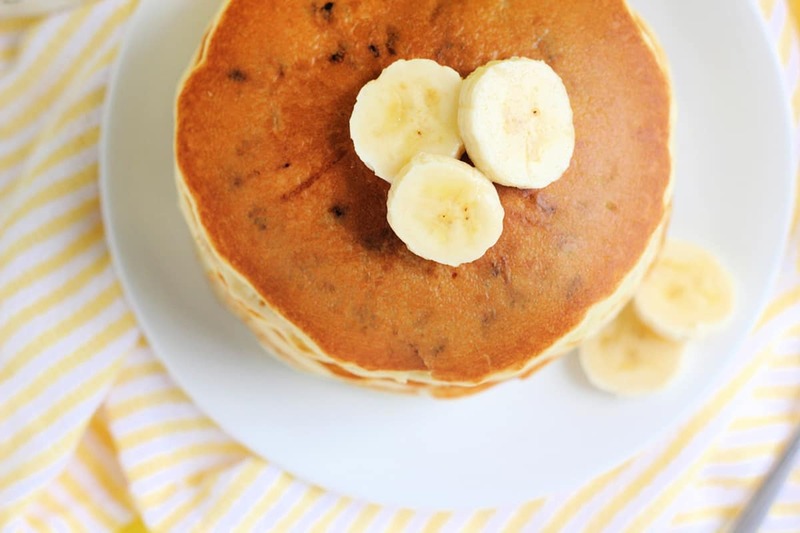 Fluffy flavor packed pancakes made with overripe bananas and sprinkled with chocolate chips. The perfect breakfast recipe. Health conscious parents look away. We recently discovered a new favorite flavor for Pancake Sunday. In other words, we created a pancake loaded with banana flavor and sprinkled with chocolate chips. The only word that can be used to describe this indulgent breakfast? 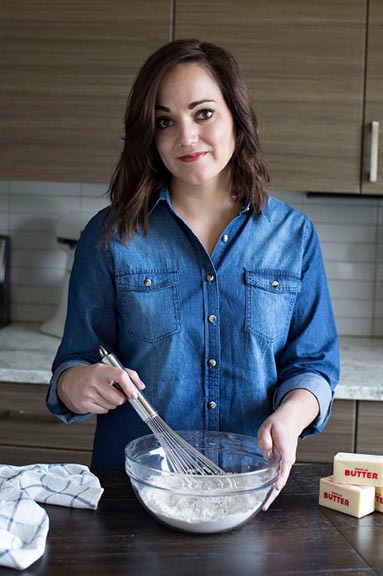 This recipe is a kid favorite. Every Sunday we make pancakes as a family. 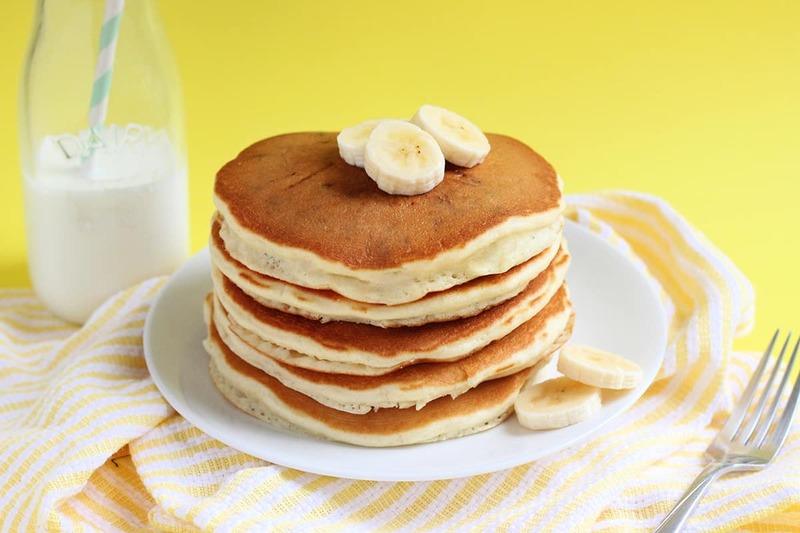 Our go-to is mainly the classic Buttermilk Pancake. This recipe is slowly making its way up the list. How do you make pancakes light and fluffy? Hand mix. Over mixed batter tends to sink. Mix only until your ingredients are incorporated. Flip only once. Wait until you see the edges of your pancake starting to curl and bubbles on top before flipping the first time. Use fresh ingredients. Baking powder and soda should be fresh. This helps your pancake rise and fluff. Like this recipe? 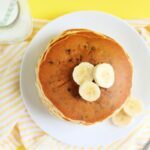 You will love my Buttermilk Pancakes, Cornmeal Pancakes, and Birthday Cake Pancakes! Hard to imagine going wrong with chocolate and banana! These sound really good, and I’m diggin’ the “Freezer Friendly” tag. I need more of those. Oh my yummyness! Looks delicious! I tried some similar a month or so ago, and my boys ate them up! I have yours pinned, I’ll have to try it next time! Yummy! Made these this morning and they were YUMMY! I only used about 1/4 cup of the mini choc chips after reading that you said they were overpowering. I am glad I did. I think they were perfect!!! We didn’t need to use syrup….we just used a little bit of butter. They were very filling. Made these this morning for “my monkey” and made them with whole wheat flour and they were yummy!! Thanks! Made these for dinner tonight and they were so good! I had a add a little extra milk in mine. Teaspoon. Thanks for pointing it out. I’ll update this recipe this week.